Investing in a new motorhome is a pricey proposition. Even entry level RVs start at about $80,000 and can go up well into the millions — especially when you start talking top-of-the-line models. That said, there is good reason to give used motorhomes some serious consideration. I recently purchased a used diesel pusher myself. It’s the one pictured here. With the economy lagging, the used RV market is still very much a buyer’s market. The key to getting the best deal is to know what it is you’re looking at when you go shopping. The average used motorhome on most dealers’ lots will have somewhere in the neighborhood of 50,000 to 70,000 miles on it. Age range can run from 5 years to 20 years. The condition of used motorhomes will be all over the map. How do you know which would be the best one to consider? And how do you know what to watch out for? #1 – In terms of maintenance, a gas engine — especially in a motorhome — has a service life of about 100,000 miles. At 70,000 miles, three-fourths of its life is spent. Sure the price of the RV has dropped, but know that if you plan to travel extensively, you will probably be investing in some pricey mechanical repairs. Diesel pusher motorhomes have the same (or similar) heavy-duty commercial running gear that’s found on many over the road trucks. They are designed to run roughly a million miles before being due for any major rebuilding. At 70,000 miles, they have just been broken in, and with proper maintenance will have most of their useful life ahead of them. #2 – Motorhomes depreciate dramatically. Gas or diesel makes little difference. They drop in value rapidly. What may have been way out of your price range new, will fall within reach in time. Surprisingly, top-of-the-line diesel pushers will often drop down to similar price levels as many Gas Powered motorhomes. #3 – Age is hard on gas-powered motorhomes. Many gas-powered RVs require lightweight construction techniques to remain viable using the less powerful gas motors. The end result is they often flex and bend. This distorts walls, loosens seams, and sets the groundwork for water infiltration over time. The 20-year-old gas motorhome that doesn’t show signs of leakage was likely stored inside. Even then, if it has normal mileage, it will likely start leaking if it’s exposed to the elements. Age is not all that important with high-end diesel pushers. Diesel pushers are built so strong that their structural integrity will be equal to almost new 20 years down the road. #4 – Rust is a deal breaker. The first thing you should do with any used motorhome is crawl under it. Before you even go inside, look the bottom side over closely. If you see extensive rust on components, walk away rapidly. Diesel pusher or not, you don’t want a rusty RV. #5 – After rust, tire condition can be a deal breaker as well. Cracked, checked tires will fail unexpectedly. Replacement will run well into the multiple thousands of dollars. Generally speaking, people who can afford to purchase new high end luxury motorhomes have sufficient funds to maintain them properly. A careful inspection will quickly confirm if that is the case. Diesel pusher or not, the used motorhome you buy should have decent tires on it. Using the 1993 Pace Arrow Turbo Diesel that I recently purchased as an example, I will run down the reasons I felt it was one heck of a bargain for anyone looking to invest in a secondhand motorhome. Its current mileage is 70,000. For 20 years old, that is very modest mileage and is leaving the majority of its life for the next owner. It came from California and was apparently stored under a carport. Paint and upholstery is in excellent condition with no dry rot from sun exposure. There is absolutely no rust underneath. It looks like it just came off the assembly line. Tires look newer — with no sign of deterioration, wear, or dry rot. Combine low mileage with minimal interior wear, it is unlikely that it was lived in full time. There is no sign of interior leakage. The roof has been recently coated and the joints resealed. All indications are that the previous owner took pride in maintaining this RV. The engine start batteries are top-of-the-line Optima AGM batteries — better than original equipment. The house batteries had stickers with installation dates of only a year ago. They’re all practically new. Because it was a high-end coach, the exterior walls and storage doors are all straight, well functioning, and still with their locks in place and operational. In today’s market, a premium level motorhome like this would be priced well over $400,000 new. 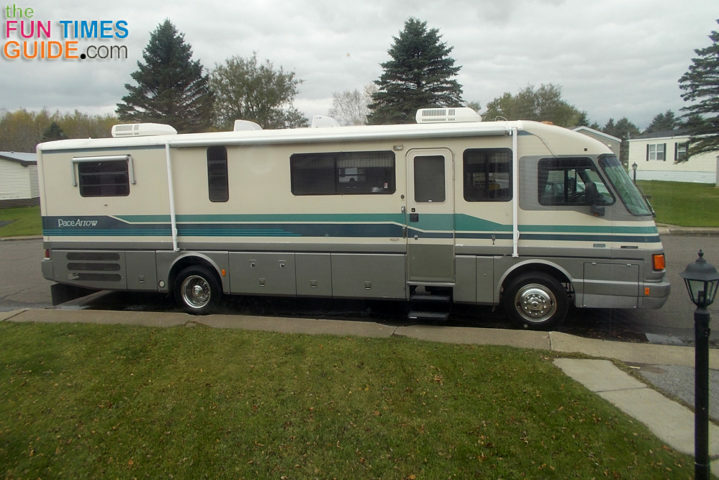 This RV new sold in 1993 for $140,000. It was recently sold for $27,000, and still has most of its useful life ahead of it. It’s definitely a buyer’s market. If you know what to look for, you can easily score a high-end champagne level coach for the price of a beer model. This one was passed over a number of times because it didn’t have a slide-out and was 20 years old. People just didn’t know what to look for.